Most people already know about ADS-B aircraft tracking, but few know about FLARM (FLight AlaRM). FLARM is a low cost and low power consumption ADS-B alternative which is often used by small aircraft such as gliders and helicopters for collision avoidance. It is used all over the world, and is especially popular in Europe, however it is almost non-existent within the USA. Back in 2014 we posted about FLARM reception with the RTL-SDR, and also about the Open Glider Network (OGN). The OGN is an online FLARM aggregator that is similar to sites like flightaware.com and flightradar24.com which aggregate ADS-B data. More recently, Łukasz C. Jokiel has posted a tutorial on his blog that clearly shows how to set up an RTL-SDR and Raspberry Pi Zero based FLARM receiver for feeding the Open Glider Network. Łukasz’s tutorial uses an Orange Pi Zero which is a very cheap (~$7 USD) Raspberry Pi embedded computing device. He also uses an RTL-SDR dongle and an antenna tuned to the FLARM frequency of 868 MHz. The tutorial goes over the Linux commands for installing the decoder, calibrating the RTL-SDR and setting up the Open Glider Network feeder. Remember that FLARM is typically 10-100 times weaker than ADS-B so a good tuned antenna is required, and the OGN recommend building (pdf) a collinear coax antenna tuned to 868 MHz. Back in June of 2014 we posted about the released of a new program called RTLSDR-Airband. 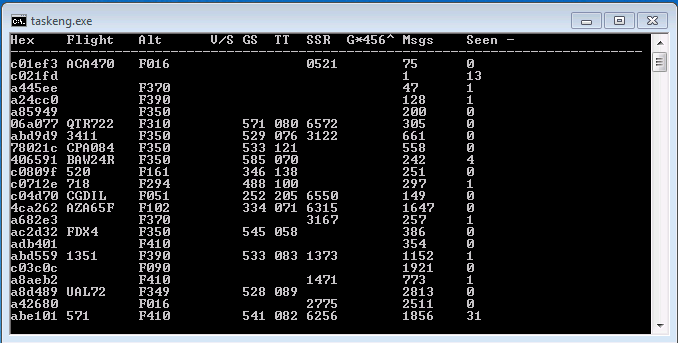 RTLSDR-Airband is a Windows and Linux compatible command line tool that allows you to simultaneously monitor multiple AM channels per dongle within the same chunk of bandwidth. It is great for monitoring aircraft voice communications and can be used to feed websites like liveatc.net. Compilation and install instructions can be found on the projects main GitHub page. 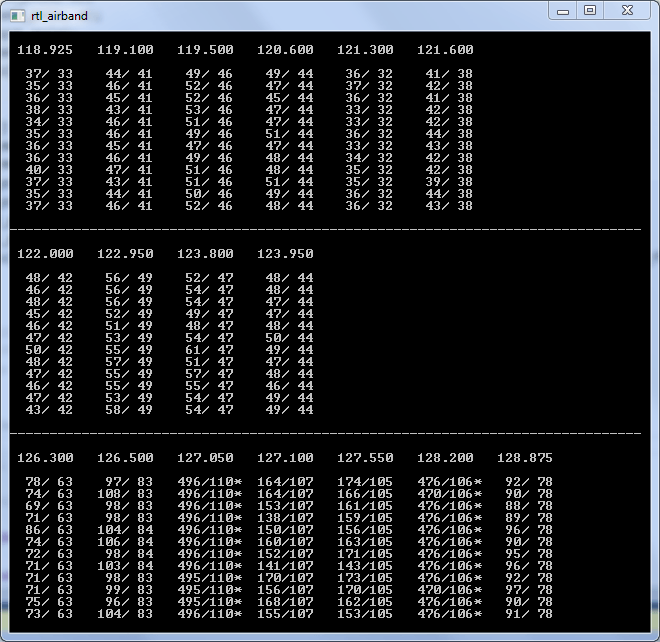 Dump1090 is a command line based ADS-B decoder for the RTL-SDR. It is considered by many to be the best ADS-B decoder for the RTL-SDR available at the moment. Dump1090 is most commonly used in Linux but over on his blog, SonicGoose has written a tutorial that shows how to use dump1090 on Windows with the popular PlanePlotter software. He also shows how to use ModeSMixer2, which is another command line utility that is used to combine data from multiple ADS-B decoders and then rebroadcast the combined feed. SonicGoose writes that the reason that many PlanePlotter users are moving away from the simpler GUI based RTL1090 ADS-B decoder is because dump1090 provides better raw data to use for multilateration. Multilateration is a technique supported by PlanePlotter which used data shared from multiple receivers to determine the location of an aircraft, even if that aircraft is not transmitting location information. Over on the Google Play store there is a new (released July 2014) RTL-SDR ADS-B Android app available for purchase called “ADS-B Receiver”. This app allows you to with the aid of an RTL-SDR and USB OTG cable, display live aircraft ADS-B data on your Android phone. This app can also be used to display the live ADS-B data in another app called “Avare”, which provides offline FAA aviation charts and other pilot tools on a Android phone. The app can be downloaded as a trial version with a fixed limit on the number of packets allowed to be received, or the pro version for around $1.99 USD with no limits. Previously on this blog we mentioned another similar RTL-SDR Android ADS-B app called “ADS-B on USB SDR RTL“. Over on our Facebook page, a user has let us know about the Open Glider Network project which makes use of the RTL-SDR dongle to decode FLARM. 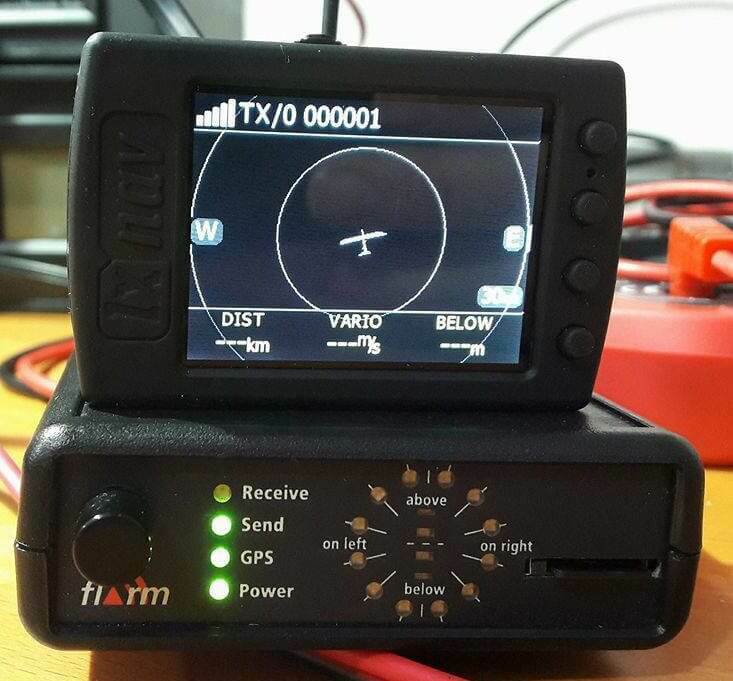 FLARM is a low cost and low power consumption ADS-B alternative which is often used by small aircraft such as gliders and helicopters for collision avoidance. With the right antenna, receiver and decoder any aircraft transmitting a FLARM signal could potentially be tracked on a map. FLARM signals are transmitted at 868 MHz and are effectively weaker by 100-1000 times compared to standard ADS-B signals. The project recommends use of a high gain collinear antenna for receiving the weak FLARM signals. The open glider network project wiki contains information on how to set up their Linux based FLARM decoder that relies on the RTL-SDR for various embedded devices. Once the software is up and running, the received and decoded FLARM packets can be seen on http://cunimb.fr/live/ as real time glider positions (also at http://cunimb.fr/live/3D/ in a 3D Google Earth). Previously we posted about the Hak5 teams attempt to create an ADS-B quadcopter receiver which carried a coax collinear antenna, ran the ADS-B decoder dump1090 on board and then transmitted the decoded ADS-B data back to a laptop on the ground via WiFi. Their results were poor due to various factors. In the latest video they read comments from fans which explain why they had such poor results, then apply some of those recommendations to a second experiment. Previously they had trouble keeping the WiFi connection alive due to poor reception, so now they use a WiFi Yagi to boost the signal strength. They also reduced the number of elements on their coax collinear antenna and moved away from the broadcast RF transmitter that they were near in their last video. There isn’t a big increase in the number of planes picked up in the second experiment but it was much more successful compared to the first. Modesdeco is a Windows/Linux/OSX/RPi compatible command line ADS-B Mode S decoder built for the RTL-SDR. It natively supports the BaseStation format and so can be used with the BaseStation software without the need for com port converters. Modesdeco has recently been updated to allow for the simultaneous reception of Mode S and Mode A/C. Mode S provides location data for ADS-B while Mode A provides an identification code and Mode C provides the aircraft’s pressure altitude.